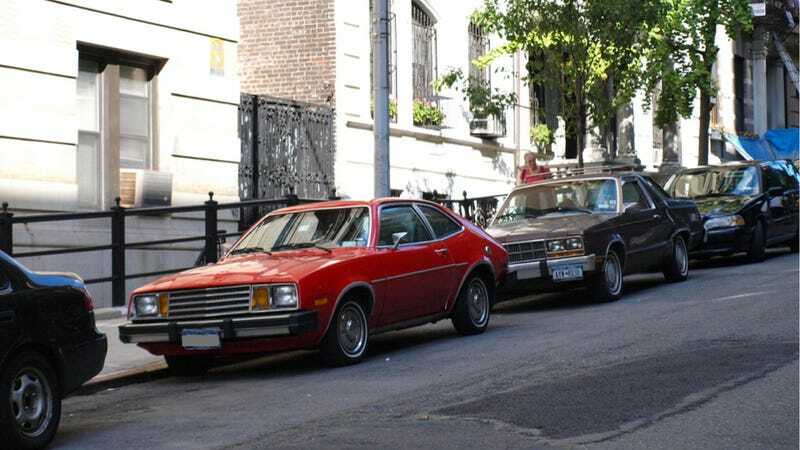 What's Hotter Than A Blazing Red Pinto? Welcome to Little Car in the Big City, where I highlight fascinating cars I found walking around a town that is known for being bigger than everything else, but where every car is fighting to stand out: New York, New York. Let's be straight with each other, just between us friends. A whole metric crapton is better than an old Pinto, but fire joke, and I am a cheap hack. But for our younger readers out there, let me first explain what the conflagration is about. The Ford Pinto went on sale in 1971 as a slightly-weird looking subcompact, but the 1970s were a slightly-weird time for everybody (you should've seen Travis, a sight to behold). It handily outsold its competitors, the Chevy Vega and the AMC Gremlin, for much of its model run. And then 1977 rolled around. Mother Jones published an article that year that alleged that when struck in a certain way from behind, the fuel tank could be punctured, leading to a massive fire, and thus fiery death. Also, possibly nuclear war, by the size of the outrage. But the outrage wasn't so much focused on the fire, but rather the allegation that Ford knew about the issue and that it would only costs 11 bucks to fix per car, but also that Ford did the math on how much they'd have to pay out in settlement costs and decided that 11 bucks was just way too much to pay for human lives. And thus Fight Club was born, and a whole generation of early teenage kids who think they are unique. So here you have a major auto manufacturer, a dinky little subcompact, and hundreds (millions?) of American lives, which are more important than any other lives, certainly Canadian lives, in the 1970s, all burned to a crisp. Surely the world would end. Ford issued a recall shortly after the article debuted, thus preventing much further fiery death, until the Pinto went out of production in 1980. So the Pinto got a bad rap as a terrible deathtrap, and Ford never really used the Pinto name again. And that would be it, if it weren't for Gary Schwartz and the Rutgers Law Review. 27 people died, out of over 3,000,000 cars sold. Which was actually quite a bit safer than most of its contemporaries. So you really could say that the only thing cooking about this Pinto is that gorgeous red paint job. Edit: Due to some technical issues, I've had to replace the original pictures. All photos are now courtesy of Raphael Orlove. Don't ask why we're all going around taking pictures of the same random red Pinto. It's not a good story.